All of our LEARN programs include on and off the water activities that make for a great summer. Swimming, games in City Park, trips throughout Kingston Harbour, BBQ lunches, and a trip to White Mountain for ice cream are all summer favourites. Morning icebreaker games and team building games get campers making friends right away. 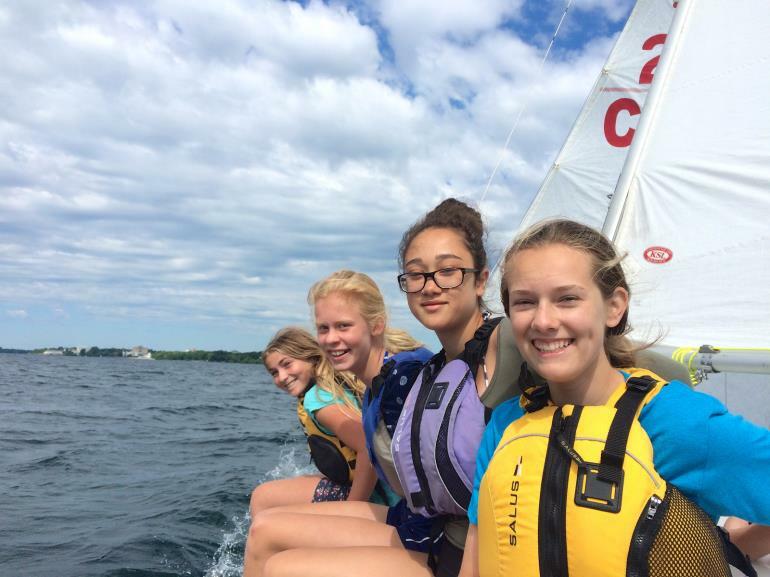 CANSail programming means lots of time on the water in a safe, fun and active learning environment, with relatively less time spent in a classroom. Sailors learn the skills and enter into fun and challenging experiences suited to their age and stage of development. The programming is designed to get - and keep - sailors excited about sailing for life! Six CANSail levels of standard promotes teaching and progressive training of core dinghy (small boat) sailing skills. CANSail is a national program standardized by Sail Canada. The program is designed to be a set of progressive learn to sail standards focused on providing sailors with a solid foundation of core skills. It allows sailors to learn and progress in any type of boat and consolidates key skills and solid experiences before adding complex skills. 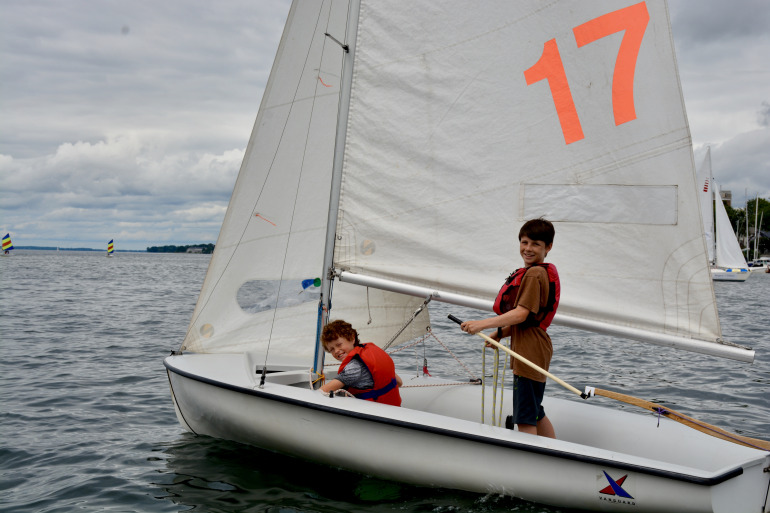 Sailing is a sport that can be started at any time, with programs suited to both level and age. 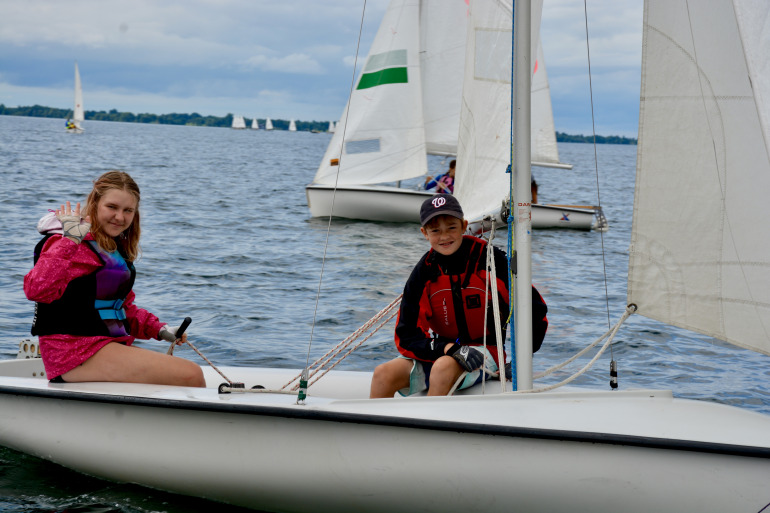 Learn to Sail focuses on getting campers on-water as much as possible. Starting small with multiple campers in each boat and a 1:6 camper to coach ratio, confidence on the water will develop quickly. Using fun, interactive games and 1-on-1 coaching, sailors learn how to handle a sailboat with a partner or small group of three. Requirements: Applicants must be at least 11 years old. No sailing experience required. If the sailor is in highschool already, they may want to consider the SHARK LTS program below. Notes: Sailors are likely to take part in the Intro Program for two or more sessions before moving into the Basic Program. Sailors will be working on their level checklist but there is no guarantee that they will achieve their level this year but they will gain experience and enjoy hours on the water. Time: Monday-Friday 9 a.m. to 4 p.m.
Ready to drive the boat? How about figure out how to go faster? This session, sailors will work on using the wind direction to their advantage and trimming the sails to get their destination faster; all while still swimming, playing games and spending time around the harbour. Requirements: Successful completion of the intro program including CANSail 1 achievement. Notes: Sailors are likely to take part in the Basic Program for two or more sessions before moving into the Basic Program. Sailors will be working on their level checklist but there is no guarantee that they will achieve their level this year but they will gain experience and enjoy hours on the water. Sailors in the Intermediate program build on existing skills in all types of conditions and to a higher level of proficiency. The boats used at KYC are double handed so teamwork plays a large part during this month long session. Sailors are introduced to concepts such as right of way, reading wind and waves, proper use of sail controls and tactical mark roundings. Requirements: Successful completion of the Basic program including CANSail 2 achievement. Notes: Part A (the first two weeks of the month) and Part B (the last two weeks of the month) of Intermediate are offered in sequence, however every session is different and curriculum is often delivered in different orders. Most sailors may need to take multiple "Part A" sections and multiple "Part B" sections before being ready to achieve CANSail 3 or being ready to progress to Advanced. Sailors will be working on their level checklist but there is no guarantee that they will achieve their level this year but they will gain experience and enjoy hours on the water. Participation in club regattas is strongly encouraged. Advanced sailors are introduced to skills like spinnaker and trapeze, beginning to work towards their Chutes and Wires certification. This program emphasizes high-performance sailing and basic racing as it lays the foundation for the Racing Team. Due to the more advanced nature of this program, a four-week commitment is required. Sailors learn and practice these skills in varying wind conditions. Participation in club regattas is expected. Requirements: Successful completion of the Intermediate program including CANSail 3 achievement. Notes: Sailors are likely to take part in the Advanced Program for two or more sessions before moving into the Race or Instructors Program. Sailors will be working on their level checklist but there is no guarantee that they will achieve their level this year but they will gain experience and enjoy hours on the water. Learn to Race sailors work on skills related to high-performance sailing and basic racing in preparation to join the Race Team. Due to the more advanced nature of this program, a four-week commitment is required. Sailors learn and practice these skills in varying wind conditions. Participation in club regattas is expected. Requirements: Successful completion of the Advanced program including CANSail 4 achievement. Notes: Sailors are likely to take part in the LTR Program for two or more sessions before joining the Race Team or moving into an Instructor's program. Sailors will be working on their level checklist but there is no guarantee that they will achieve their level this year but they will gain experience and enjoy hours on the water.